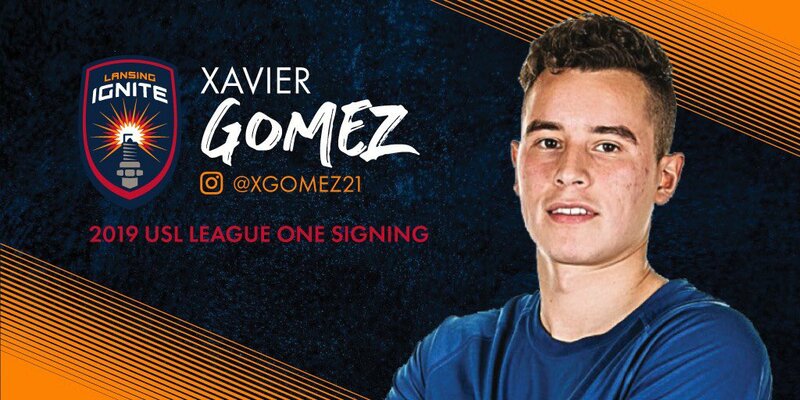 On Monday, former MLS midfielder Xavier Gomez was announced as the first player to sign with Lansing Ignite FC, founding member of the USL League One. Gomez will join the franchise for its 2019 inaugural season, pending league and federation approval. Gomez was selected 41st overall by Minnesota United FC in the 2018 MLS SuperDraft after a successful career at the University of Nebraska Omaha (UNO). He was a three-year starter for UNO, where he led the Mavericks to their first NCAA tournament berth in 2017. He was named to the All-Summit League First Team that year and led the conference with eight assists and five goals. Before college, Gomez played in the U.S. Soccer Development Academy with Chicago Magic PSG, leading his side with nine goals in 30 games (25 starts) and helping them reach the USSDA Playoffs in June 2013. Additionally, he was named one of the top 20 players to watch in the Midwest in both 2010 and 2011 by Top Drawer Soccer. He attended Maine West High School in Des Plaines, Illinois, and was awarded the team’s Mr. Offense award. The team will begin practice in February 2019 with their first match date to be announced soon. Additional player signings will take place over the coming weeks with announcements to follow. For more information on Lansing Ignite, visit www.lansingignite.com or follow the team on social media.